BRUSSELS, Belgium -- NATO members agreed on Thursday to step up support for Ukraine with more air traffic data and assistance in countering roadside bombs, but member states stopped short of offensive weapons, which Kiev has sought in its battle with Russian-backed separatists. NATO Secretary General Jens Stoltenberg on June 25, 2015. A new trust fund to be established “will aim at de-mining and also on countering improvised explosive devices. And this is vital for saving lives,” NATO Secretary-General Jens Stoltenberg told a news conference after a meeting of the NATO-Ukraine commission. NATO defense ministers are set to conclude two days of talks in Brussels later Thursday. The ministers have focused primarily on concrete steps toward strengthening the alliance militarily, enabling to respond more quickly to crises. Members have agreed to increase the size of its crisis-response force and to streamline the political process for approving the mobilization of troops. The trigger for those efforts has been the unrest in Ukraine, where Russian-backed separatists continue to violate a cease-fire deal in the country’s east, Stoltenberg said. 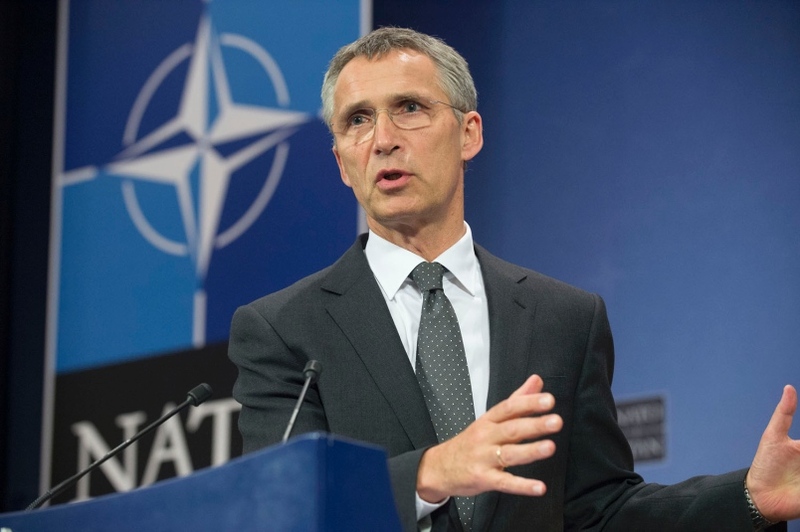 NATO will continue to assist the country in its efforts to reform its military, helping in areas such as command and control, establishing secure communications and logistics. In the wake of the downing of Malaysian Airlines MH17 in eastern Ukraine last year, which the West has blamed on Russian-made anti-aircraft weapons fired by separatist fighters, concerns have also grown over air traffic security. Poland, Romania and Turkey will provide more data to help Ukraine better protect its airspace, Stoltenberg said. That falls short of Ukraine’s hopes for lethal weapons. “Regarding lethal weapons, we have a request on that. And to defend Ukraine, we need such weapons,” Ukrainian Defense Minister Stepan Poltorak said before Thursday’s meeting, Interfax-Ukraine reported. NATO ministers also turned their attention to Afghanistan Thursday. In May, NATO foreign ministers announced that they would maintain a military presence in Afghanistan once the current train, advise and assist mission called Resolute Support concludes, but the effort will transfer to civilian leadership. NATO hasn’t specified when it will end Resolute Support, successor to the NATO-led combat mission, which ended last year. “No final decision has been made,” Stoltenberg said. Details about the size and scope of the next phase, including troop numbers, are expected to be worked out by the fall. It is expected to have fewer personnel than the current training campaign, which involves about 13,000 international troops. The decision to extend NATO’s presence beyond 2016 underscores concerns about the ability of Afghan security forces to cope with an intractable insurgency, which continues to battle for control of key districts and to launch high-profile attacks in the capital, Kabul. There also are concerns about foreign fighters moving into Afghanistan, such as the Islamic State group, but Stoltenberg said there are indications that some fighters calling themselves members of the group could be engaging in rebranding. “It is obvious we face many challenges, including the presence of foreign fighters,” Stoltenberg said. Just this week, fighters carried out an attack on the Afghan parliament building in Kabul and were within miles of taking the city of Kunduz. If they had succeeded, it would have been the first Afghan city to fall since the Taliban were toppled in 2001. “The security situation remains difficult, as we have seen early this week in Kabul,” Stoltenberg said.